What to do on a hot summer day in Victoria? Record temperatures were posted for Canada's National Holiday. Our thermometer, which is in the shade, posted 33 degrees C. So we did what many other Victoria residents did, go to the beach. There are lots of choices. Since we now live on the West Shore, our choice was Esquimalt Lagoon. We were not alone. The massive expanse of the beach along the ocean side of the lagoon had people stretched from one end to the other. 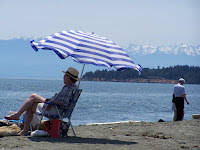 This beach offers spectacular views of Juan de Fuca Strait and the phenomenal Olympic Mountains. There were numerous tall ships and sail boats out in front of Victoria's Inner Harbour and many sailed towards us during the afternoon. The temperature at the beach was a respectable 24C. Join us at the beach on the next super hot day.